The fourth leg is 7.5 kilometres long with a height difference of 250 metres. The highest point is 780 metres high and is reached at Sella di Malpertuso. Completion time is two hours and a half. The walk starts out again inside the woods, till it reaches the northeastern Sella of Malverde, where it crosses the path to Corniglia. One proceeds along a pinewood till the Sella della Cingoletta (612 metres high), where one crosses the paths to Vernazza and Riccò del Golfo. The path reaches its highest point, proceeding through woods of pine and chestnut trees, reaching the summit of the Cinque Terre: Monte Malpertuso (815 metres high). Once there, one proceeds, again through woods, to reach a dirt track for Foce Drignana, but the path continues further down. 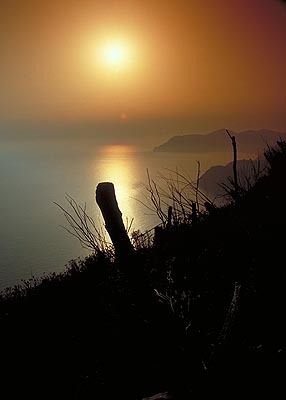 In short, one reaches Foce Drignana, at 534 metres altitude, where path n°8 to Vernazza begins. TREKKING ON THE PATHS OF CINQUE TERRE WITH NATURALISTIC GUIDE!